Rhodos has become a favorite of vacationers who want to spend a relaxing time that is far from the busy streets of the city. The island is just perfect both for families and couples who want to spend some time under the sun. There is also plenty of exciting activities that you and your loved ones can do here. 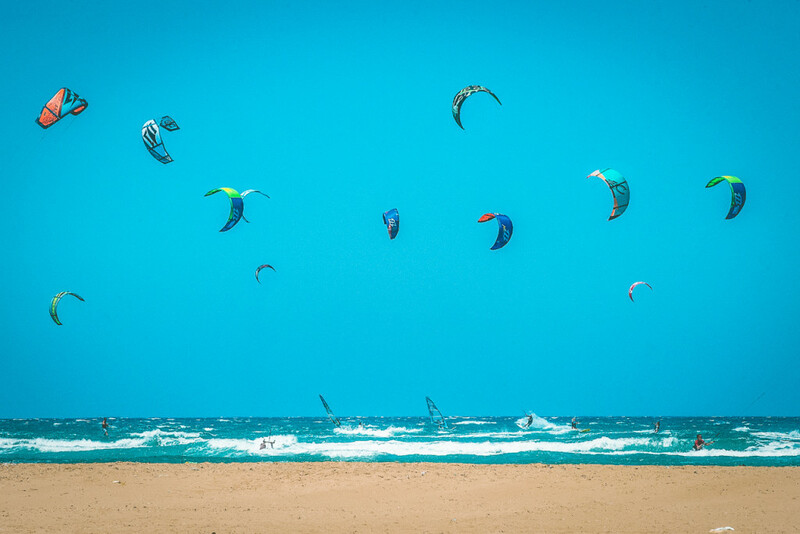 One of the most popular and equally exciting is kitesurfing. Kitesurfing or kiteboarding is the fastest growing water sport in the world, and for good reason. A kitesurfer uses a board with foot-straps or bindings, combined with the power of a large controllable kite to propel himself and the board across the water. He has the freedom of jumping 3 – 4 meters off the water, without the necessity of a wave for a ramp. Windsurfers love it because you can kitesurf in less wind, and the gear fits in a economy car, instead of the van, truck, or trailer. Surfers can get out on the water when the surf is too low or blow out. In Ixia bay, in Ialyssos, in Kremasti, in Tholos and Prassonisi there are several windsurfing and kite surfing centers where you can the required equipment and follow courses by well known professional instructors.